Using Transmission Electron Microscopy-related techniques, we study the effect of the high temperature in the Vapour Phase Transport (VPT) process on the morphology and chemistry of VPT ZnO nanorod arrays deposited on a two-step Chemical Bath Deposition (CBD) buffer layers on silicon substrates. Though well-aligned and c-axis oriented arrays of ZnO nanorods are achieved, we have noticed the strong dependence of the nanorod morphology on the VPT growth conditions such as the temperature ramp rate and the placement of samples with respect to the metal source. The development of conical structures in the nanorod bases and the formation of a double intermediate layer below the base of nanorods are the main features found. 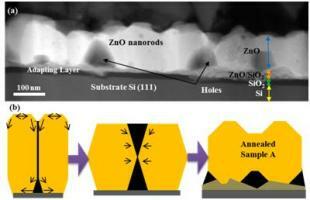 The modifications of the ZnO nanostructures both in the base and in the underlying buffer layers due to the high VPT temperatures are also examined in detail.